Located on a gorgeous ridge above Pigeon Forge, Eagle Crest cabin resort is ideal for enjoying Smoky Mountain views and long days at Dollywood. Though these cabins are located at a Sevierville address, Eagle Crest cabins enjoy a prime location for experiencing Pigeon Forge attractions. Perched above Upper Middle Creek Rd, Eagle Crest resort is a popular place for vacationers to find convenient log cabins near Dollywood. Eagle Crest cabin rentals in Sevierville are also only minuets from the non-stop action Pigeon Forge parkway. Even better, these cabins are well positioned for day trips into Gatlinburg and the Great Smoky Mountains National Park. While features vary depending on the cabin, Eagle Crest cabins often offer great cabin amenities like hot tubs and gas fireplaces. Even better, the cabins at this ridge-top resort offer wooded mountain views. While Eagle Crest cabins are located near great area attractions like Dollywood, these cabin rentals also offer guests the chance to enjoy the natural beauty of the Smokies. Imagine retiring to your affordable Pigeon Forge cabin near Dollywood just in time to enjoy a Smoky Mountain sunset from your cabin's back porch. These Sevierville, TN cabins also feature practical amenities such as in-cabin kitchens, washers, and dryers for your convenience and comfort. Expect great vacation savings when you stay with Cabins USA! By booking an Eagle Crest cabin online you will receive a 15% discount! 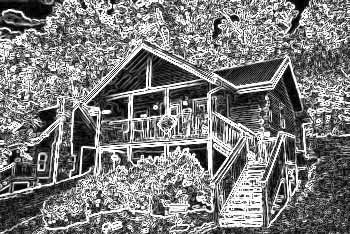 Begin your memorable Smoky Mountain vacation with a premium Cabins USA cabin rental.